Description: Individually hand blown pieces of glass in sculptural and functional forms. Profile: Born in Prague and brought up in England, Peter Layton studied ceramics at the Central School of Art and Design in London under some of the foremost potters of the day. 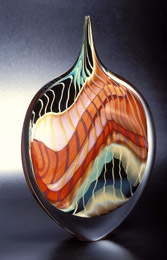 He chanced upon glassblowing while teaching ceramics at the University of Iowa and since returning to Britain has been continuously at the forefront in promoting this magical and versatile medium.In the early 70s Peter Layton was instrumental together with Sam Herman, in setting up the Glasshouse in Covent Garden. He subsequently established his own small glass studio at his pottery at Morar in the Highlands of Scotland, a Glass Department at Hornsey College of Art (Middlesex University) and in 1976, the London Glassblowing Workshop.